I want to find an address in Maps, let's say it's Baker Street, 221b, London. 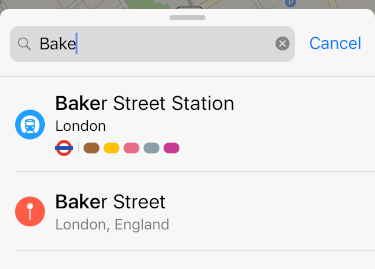 So I begin to type "baker street" into the search field in Maps. Soon, after 3-4 typed characters, "Baker Street, London, England" appears among suggestions. If I tap on the suggestion, Maps will set a red location marker somewhere on the street. Now, I don't want the street, I want a particular house number on it. How can I change the Maps suggestion to add a house number? Currently I type the whole street name and then type the house number at the end, and this is not very convenient, especially if the street name is long. How can I open a Google Maps URL in Apple Maps?